If you’re looking for giant SUVs with ridiculous power figures, these are your choices. I love powerful cars, even if they can only go in a straight line. The HEMI-powered Chrysler L-cars, for example; they’re not good in the turns, so the only reason to have the big engine is for straight-line grins. Is it fun? Yes. Is it all kinda pointless? Sure. The idea of shoehorning big, powerful engines into strange cars for pure straight-line speed is the very essence of hot rodding, and it’s about as American as things get. Back in the 1990s as the SUV craze was brewing, automakers decided to try out high-powered versions of their high-riding wagons. The GMC Typhoon and Jeep Grand Cherokee 5.9 come to mind. And it seems to have stuck, because the practice of hot-rodding SUVs is still alive and well, with even the Germans and Brits getting in on the action. Here are ten ridiculously, pointlessly powerful full-size SUVs. Click on their names to learn more via their Buyer’s Guides or other related articles. The Mercedes GLE replaced the ML, which we’ve argued started the luxury CUV craze back in 1997. The GLE has grown up, though, now offering two body styles — SUV and coupe — and absolutely asinine amounts of power. The AMG GLE 63, offered only in the SUV body style, comes with a 550 horsepower, 516 lb-ft twin-turbo V8 engine and gets to 60 MPH in only 4.2 seconds. That’s a bonkers number for a car that weighs nearly 5,000 pounds. But that’s a tame engine compared to the one in the GLE 63 S SUV or Coupe. Making a ludicrous 577 horsepower and 561 lb-ft of torque, and sending that power through a seven-speed automatic and finally to all four wheels, the GLE 63 S sprints to 60 MPH in 4.1 seconds. Perhaps two of the best SUVs on earth, the Range Rover and Range Rover Sport both get supercharged five-liter V8 engines producing over 500 horsepower. The Range Rover Sport SVR is the fastest of all Range Rover variants, using its 550 horsepower and 502 lb-ft of torque, along with its eight-speed auto to sprint to 60 MPH in only 4.5 seconds. The long wheelbase Range Rover SVAutobiography model also gets that 550 horsepower V8, but with its added heft requires 5.2 seconds to get to 60 MPH. Both the Range Rover and Range Rover Sport come can be had in Supercharged or Autobiography trims, too. Those trims get the same 5.0-liter supercharged V8, except that it makes only 510 horsepower. That’s still enough to get the Range Rover to 60 in 5.1 seconds, the long wheelbase Range Rover to 60 in 5.5 seconds, and the Range Rover Sport to 60 MPH in five seconds flat. So if you’re looking for a quick 5,000 pound Range Rover, there are plenty of variants to choose from. If this list were in order of Pointlessly Overpowered-ness, the Mercedes G-Class would be at the very top, followed by many lines of blank space, and then the rest would follow. That’s because, more than any other car on this list, the G-wagons engines write checks its chassis can’t even come close to cashing. The AMG G63 gets a 5.5-liter twin-turbo V8 that makes 563 horsepower and 561 lb-ft of torque. Go up a trim, and you’ll get a stupefying 621 horsepower, 738 lb-ft powerhouse beneath the hood of the AMG G65. Seven Hundred And Thirty Eight foot pounds! All of that strapped to 5,900 pounds of old-school SUV results in a pointlessly awesome SUV that still looks much like its predecessor from the 1970s. The Porsche might be the most athletic full-size SUV there is, so maybe we shouldn’t call it “pointlessly powerful,” because it can actually make use of its power on the track. The Cayenne Turbo gets 520 horsepower and 553 lb-ft of torque from its twin-turbo 4.8-liter V8. At 4.2 seconds to 60 MPH, it’s quick. But the Cayenne Turbo S is in a different world. It does things that physics says 5,000 pound vehicles shouldn’t be able to do, using its 570 horses and 590 lb-ft to shoot to 60MPH in only 3.9 seconds. The Jeep Grand Cherokee started out life as a fairly simple off-roader. Sure it had coil springs instead of leafs and lots of interior space, but it came with two soid axles and could be optioned with a manual transmission. But 1993 flew by and in 1998, Jeep decided to put a big 245 horsepower 5.9-liter V8 in their Jeep. It also got a unique body kit with hood louvers, sporty wheels, a unique grille and a beefed up transmission. Marketing it as the “fastest SUV in the world,” Jeep sold 15,000 of what later became known as “niners” among Jeep fanboys. 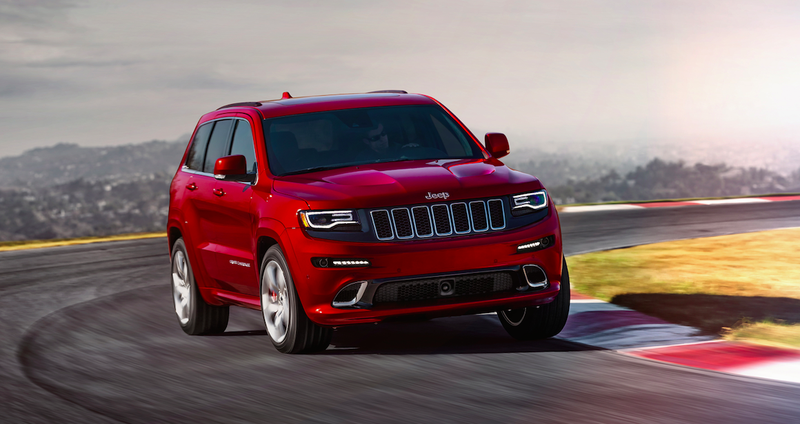 Fast forward to today, and Jeep’s still putting giant engines in their flagship SUV. But now it’s a 475 horsepower, 470 lb-ft 6.4-liter V8. Mated to an eight-speed auto, the 5,150 pound SRT8 romps to 60 MPH in 4.8 seconds. But that’s small potatoes compared to the 707 horsepower Hellcat Grand Cherokee coming next year. The Mercedes GL is Daimler’s biggest SUV at more than 202 inches in length and over 5,500 pounds. It’s also a quiet, supple fortress on wheels. Except maybe when you get the AMG GL63 version. The GL63 trades “quiet” in favor of a 5.5-liter twin-turbo V8 making 550 horsepower and 560 lb-ft of torque. That, coupled with a seven-speed automatic, is enough to move Stuttgart’s leviathan to 60 MPH in only 4.8 seconds. If that’s a bit too much for you, there’s also a 4.7-liter twin-turbo V8 offered in the GL550 trim. That one makes 429 horses and scoots to 60 MPH in 5.5 ticks. The BMW X5 and the X5 Without Room In The Back For Human Heads (the X6) both get am M version. The X5M and X6M get the same 567 horsepower, 553 lb-ft 4.4-liter twin-turbo V8 mated to an eight-speed automatic, and both can shoot to 60 MPH in only four seconds. Yes, 5,000 pound SUVs can get to 60 MPH in only FOUR SECONDS. Clearly BMW is putting their power down very efficiently, or their engine makes more than their rated output (not unusual for BMWs). The Bentley Bentayga isn’t out yet, but the 5,379 pound goliath has a huge 6.0-liter twin-turbo W12 engine making 600 horsepower and 664 lb-ft of torque. That’s enough to get Bentley’s 230,000 dollar SUV to 60 MPH in four seconds flat.